The inspiration for this post came during an early morning ride to the airport. I was flying to the west coast and on the way to the airport I was listening to an article on NPR about the 150th anniversary of the Battle of Antietam. 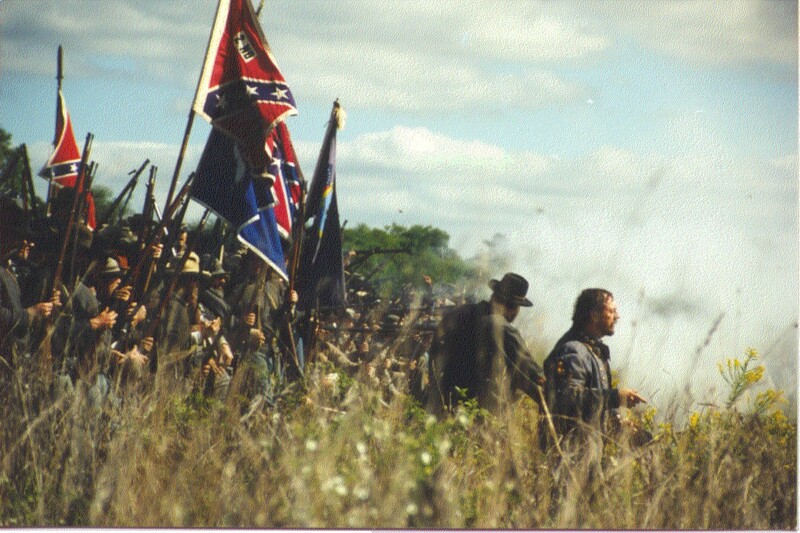 When I was younger, I spent a decade reenacting the American Civil War on the weekends. I caught the 130-140th cycle, I was a man in the ranks in a handful of movies and productions. Over the past decade, family and work have taken then toll on my free time. I am not complaining; I just miss the diversion. I travel a lot, I blog, I email, I tweet, I am constantly on the go for work. When the 150th cycle started last year, I was conscious of the start, but it is only recently I have realized what I have been missing. I was flying last week and listening to Knee Deep by the Zac Brown Band. The part of the song that begins “Going to put the world away for a minute and pretend I don’t live in it.” That is the part I am referring to. The diversion of reenacting and the desire to drink from the well. Let me explain. Antietam is important event in my family. My 3rd great grandfather (picture to the left) was captured at Harper’s Ferry in the opening phase of the Antietam campaign. He was paroled in time to make Gettysburg, stand just to the right of the copse of trees to receive the Confederate charge on the third day and a few months later take a mini ball in the left knee at Bristoe Station. He is buried at Alexandria National Cemetery. 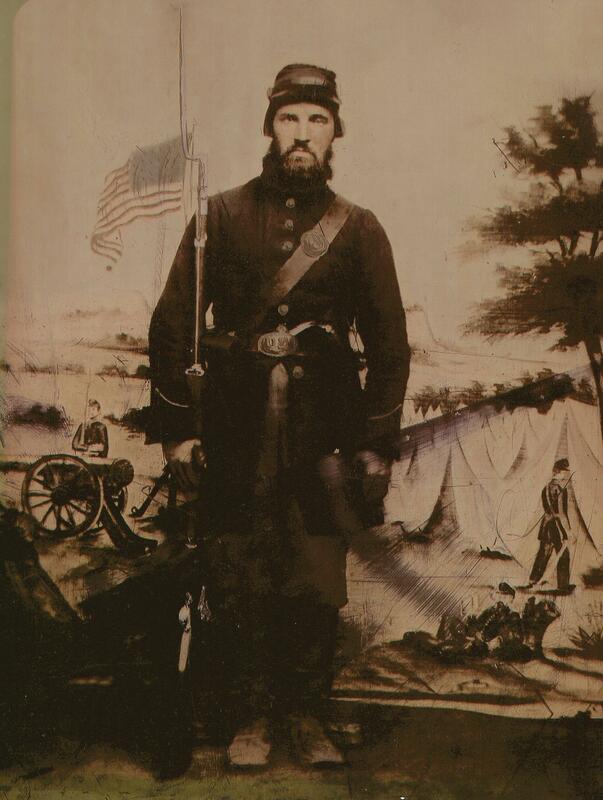 His picture hangs in the visitor’s center at Gettysburg. As reenactors, we begin our journey of enlightenment by reading historical accounts of the Civil War. For the truly passionate student of history, the passages we cherish are not enough and we find our way to reenacting. The siren’s call is too great and like Odysseus, we willing guide ourselves into the world of antiquarianism seeking inclusion. This is where we discover the well of understanding; a well that quenches our thirst for only but a fleeting moment. Reenacting is seeking enlightenment through the antiquarian experience. History is far more than a collection of dates, places and people – it is a collection of experiences, achievements, sacrifices and expressions. History is details. History is tragic. History is our lineage. Reenacting provides a well of experiences and details that foster a stronger, personal understanding of our past. As your understanding of the Civil War grows through reenacting, your thirst to drink from the well becomes stronger. The well provides insights to you that pass by others like a summer breeze. 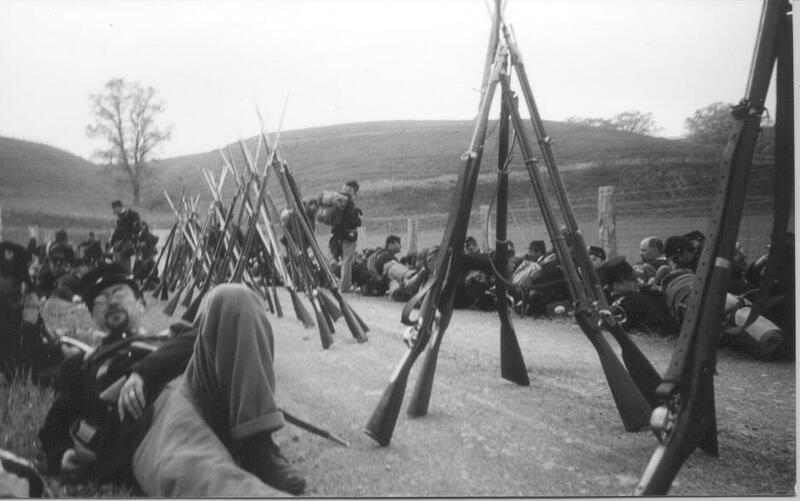 As a reenactor, you can stand on the fields of Antietam and feel the pain in your feet when you think of A.P. Hill’s Brigade in 1862. You can feel how the packs and bedrolls can bite into a man’s shoulder on a long march. You shift your weapon from shoulder to shoulder. You know what it is like to peel the hot, wet wool from your body after marching in the Virginia sun for several hours. When you drive through a small New England town and stop for coffee, you spy a monument in a forgotten corner of the town center. To the average American, the monument is clutter left from a prior generation – but to you it is something important, something to be cherished. You feel a need to greet the monument. You cross the street and take the time to walk over and read the monument. Others look at you as if you are lost. The names leap off the granite: Cedar Creek, Five Forks, Cold Harbor, Gains Mill and Second Manassas. As a reenactor, you know the ground. You have stood in the rifle pits at Cold Harbor. These are not words from a generation long departed – they are a collection of experiences from the well. You dip into the well and the experiences wash over you. You remove your hat. Perhaps you wipe your brow. You can hear the sounds of the muskets, the roar of the cannons and the stress of the engagement. Orders are given “load,” “ prepare to fire,” “aim,” “fire!” You can feel the ripping, tearing vibration of the volley. You know the difference between fire from a skirmish line and fire from regiment in line. The smoke fills your head and teases the senses. You feel a tingling sensation as you can see the battle flags on both sides. You know these flags as you can see them waving defiantly in the breeze above the men. You can see the First National Flag of the Confederacy. Flags from Hood, Kershaw, Hill, Armistead and Cleburne fill your view. Here stand the men from the South; men from Charleston, Georgia, North Carolina and Virginia. Ghost brigades that once marched proudly to the call of their cause. I often tell people if you want to understand America, read about our Civil War. The good and the bad of our culture is embedded in these four years. Read the really good words. Read Chamberlain, Catton and Foote. I would even tell you to start with the Killer Angels. I have reenacted on both sides the Civil War. That is how I know how embedded the history is in our culture. My great grandfather wore blue, but I am comfortable in gray. My wife’s family wore gray. When I was young, I would go visit my grandmother in upstate New York. There was a tree I would pass on every visit called the scythe tree in Waterloo NY. In 1861 James Johnson hung his scythe on the crotch of a small cottonwood tree and said to leave it there till he returns from war. It is still there. I think this tree might be the place I first became aware of the Civil War. Over the past decade I have repressed many of reenacting urges. It is easy to think the road trip is too long. There are too many things to do around the house. There are football games to watch and family affairs to attend to, but I can never escape our history. It surprises me on a Monday morning in the hour before dawn. After I cleared security and was sitting at the gate, it occurred how to me how comfortable I was. I had my coffee, my iPhone and all I had to do this day was fly to SFO, respond to some emails and attend a cocktail reception. 150 years ago the men who awoke around Antietam had a much different day ahead of them. That is what annoys me about the Civil War. It tugs at me when I am not expecting it. If you have ever been to Gettysburg on July 2, then you know as you walk the line of the 20th Maine or on July 3 as you stand in the woods where Pickett’s men stood staring across the Emmitsburg Pike. If you have every stood in the fields and woods around Shiloh in the early morning hours of April 6, you will realize you are not alone and that we cannot escape our past. As I finish writing this post, I raise a glass of whiskey to those who have gone before and the vacant chair.